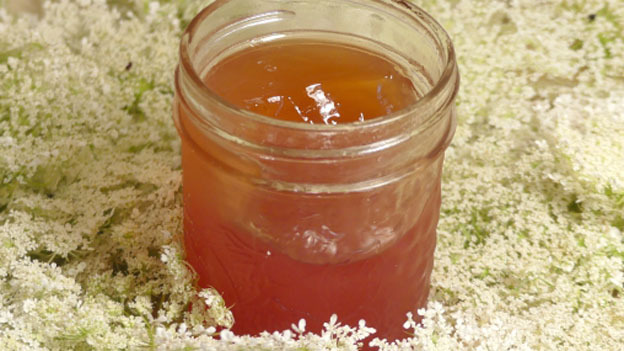 A summertime jelly that has an exquisite taste. Bring water to boil. Remove from heat and let cool 5 minutes. Add flower heads and push them down into the water until fully covered. Cover and steep one half hour. Strain. Measure 3 cups of the liquid into a pot. Add lemon juice and pectin. Stirring constantly, bring to a rolling boil.Add sugar and stir constantly. Cook and stir until mixture comes to a rolling boil then boil one minute longer. Remove from heat.Skim. Pour into steralized jars leaving 1/4” head space. Process in a hot water bath for 5 mins.